Are you new to the Labyrinth? Or have you already discovered the ancient practice of walking the Labyrinth? 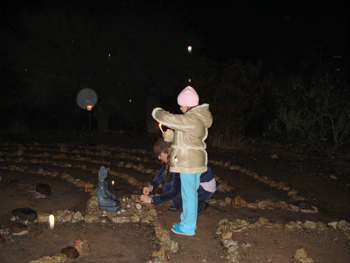 Every month on the full moon the Peaceful Spirit Labyrinth plays host to a walk that is both introspective and spiritually uplifting. A diverse and fun group gathers under the desert full moon. We are drawn together for this walking meditation that not only solves problems, but also clears the mind, calms the soul, mends the heart and heals the body. Whether you are new or an experienced walker you are invited to share in the special walks held at the Peaceful Spirit Labyrinth. Walking the Labyrinth is an infinitely repeatable activity; each walk however, will be unique and distinctly different. No two walks are ever the same, yet the pattern and the process are always constant. Unlike a maze, the Labyrinth is a one path design, there are no wrong turns or decisions to be made. Much like the surrender to walking a sacred spiritual path in life, your only decision is to take the first step. The Labyrinth is a gift to be shared, a journey to the center of your very being. As you begin your walk toward center you are invited to release - release old patterns, painful emotional memories, worries, unhappy behaviors or just the everyday mind chatter. Arriving at the center you are invited to experience your own essence - a space of mindfulness. At the center of the Labyrinth know that you are in harmony with the great mystery. Leaving the center takes you back into your life empowered with new insights, gifts and a sense of wholeness. Each one handmade by Tom! Only $47Help support the center! Handcrafted wood Labyrinth 14" x 11" variety to choose from. Using the Labyrinth as a tool for creative exploration we can provide workshops that incorporate individual and group activities. 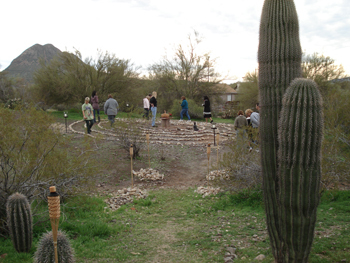 Our workshops provide time and space for quiet reflection and meditative Labyrinth walks. Walking the Labyrinth can be a transformative experience, as we walk the turns and counterturns the world begins to drop away and our pace becomes a background rhythm against which we are able to clear our minds. We tailor presentations and workshops to your group's or organization's needs. We offer dynamic presentations about the Labyrinth, its history and uses. 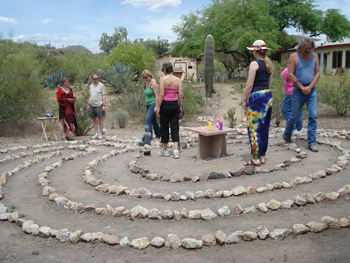 All our events are conducted by a Veriditas Certified Labyrinth Facilitator and can be held at our facility or yours. Presentations are generally one to two hours in length. 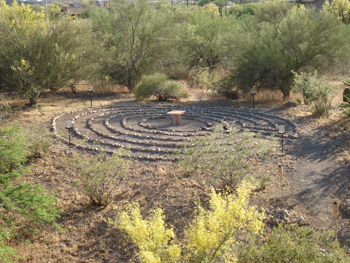 Workshops that include opportunities to walk the Labyrinth can range from half-day sessions to retreats of two or more days. Contact us to help design your next Labyrinth experience! You hold such a powerful and profound sacred space for these gatherings. Thank you so very much for offering this wonderful experience" — Honey L.